Sanctuary... a place of refuge providing safety from those who would bring you harm. Sometimes those who seek sanctuary are not those who you would expect to do so. Even the blackest heart needs someplace that they can call home. The rural backwater of Cherrimoor is a place far from the political intrigue of the towns and cities but it has its own stories. A Gothic adventure unfolds, involving a search for a fallen paladin, a family curse and the new tenant of Tharlin Keep. 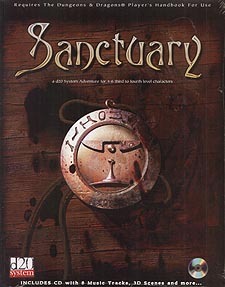 Sanctuary is a role-playing game for 4-6 characters of levels 4-5. It includes a detailed local setting, maps and core plotline that can be used with most d20 fantasy games and comes with a bonus CD containing Music Tracks, key scenes, and building rendered in 3D.